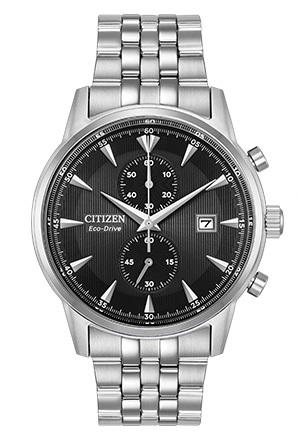 The byword for this timepiece from CITIZEN®'s Corso collection is versatility. Shown in a stainless steel case and bracelet with a black dial, this timepiece features a 1/5-second chronograph that measures up to 60 minutes and a screw-back case. Water resistant up to 100 metres.